Technology for Industry 4.0 and the Circular & Bio-Economy Inspiring a sustainable & competitive future. 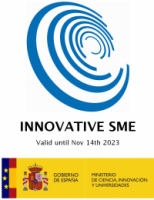 Recently, the General Directorate of Research, Development and Innovation has awarded IRIS TECHNOLOGY SOLUTIONS SL the Renewal of its Certificate as an Innovative SME until November 14th 2023, that is created and regulated by the Order ECC/1087/2015. We are very proud of this announcement, so we will keep dedicating all our efforts and resources to work effectively in the same innovative line to continue being worthy of this certification.